Bryn Chancellor’s collection When Are You Coming Home? won the 2014 Prairie Schooner Book Prize. Her stories have appeared in Gulf Coast, Colorado Review, Crazyhorse, and elsewhere. She has received the Poets & Writers Maureen Egen Writers Exchange Award in fiction, literary fellowships from the Alabama State Council on the Arts and the Arizona Commission on the Arts, and scholarships from the Bread Loaf and Sewanee Writers’ Conferences. Erin Flanagan is a quarter-finalist judge for the Prairie Schooner Book Prize and helped to select Bryn’s book for publication. Erin Flanagan: I remember reading your collection as a quarter-finalist judge for the Prairie Schooner contest and really loving it. I looked back at my notes and had written “the author is writing really wonderful, tight domestic stories about everyday lives, seeing what’s extraordinary about the ordinary.” What draws you to these ordinary moments, and how do you find the extraordinary? Bryn Chancellor: Thank you, Erin; those are kind words, and I’m grateful that you see the stories that way. You know, I worry sometimes about my attachment to the ordinary. I worry I should be writing “bigger.” I’m not sure I even know what I mean by this exactly—I guess stories with a large scope, that tackle important cultural, political, and social ideas. But stories always come to me first through that seemingly small scope of the everyday. There’s an assumption, even in the language itself—ordinary vs. extraordinary—that the ordinary doesn’t have the spark, that the value lies beyond, in the extra. I like to complicate that. I don’t always know that I will find something extraordinary in the ordinary, but I always believe it’s there. In life, I am confounded again and again by what people might do or say that defies expectations or assumptions. That’s true, too, in fiction. If I stick with characters long enough, I find the complexity, the turn, the unexpected moment. Of course, I hope that my stories speak to larger concerns—that through the individual we find the universal. Many of my favorite plot lines in fiction, and in your stories in particular, come from two disconnected characters colliding. In the title story we have Robert and Kyla, and in “At the Terminal” we have Francie and the guy at the airport. What about two strangers and their influence over each other appeals to you? I love throwing strangers together. In life, I’m always fascinated by the odd intimacy and lack of inhibition that can come about in a chance meeting—an exchange at the bus stop, at the coffee shop, on the train, even on the airplane, heaven forbid. It’s almost an out-of-time moment, even a confession of sorts, because we never have to see this person again. In fiction, having a chance meeting is great way to think about how characters would react in that confessional space—what might they do with a stranger that they might not do with friends or family? A piece of advice I once got about developing a character was to put her in public, in private, and alone. I’d add, with a stranger. Another aspect of your fiction that I really admire is that not everything heads toward what George Saunders calls the “habitually catastrophic.” It takes some finesse to recognize the value of optimism in a story, and to create an optimistic ending that’s not falsely positive or perfect for the characters. How conscious are you of heading toward a more hopeful ending, such as the ending of “All This History at Once,” or is it simply where certain characters lead you? I didn’t know that Saunders calls it that; I love that phrase and insight, and it’s true that catastrophe can be (over)used as a go-to for dramatic tension. Yes, I think I’m always conscious of hope or darkness in a story’s resolve. Really, you nail it when you say an ending that’s not falsely positive. As much as I want to fix or solve my characters’ troubles by the end—and I push them into some dark territory—I sometimes have to leave them in a rockier place because that’s true to the story’s terms and where the characters are in the climactic moment. That’s often hard for me. In my life, I’m a fixer and a worrier and I want people to be okay. In “All This History at Once,” I wasn’t sure at first how it was going to end for Odette emotionally; I knew the climactic scene on the stairs but not what she’d do after. I didn’t know she’d start laughing, but when I finally wrote her reaction, it seemed true to her and to the moment. I thought, Okay, she can have this. And that helped me finish the story with that more unambiguous note of hope. Do you have a favorite story in the collection, and if so, why that particular one? Oh, wow. I don’t know! I always think of them in terms of what they taught me as a writer, what I played with or figured out or sweated over or pulled my hair out over. Each has a different resonance because I know the process of writing them. The story I wrestled with the most was “This Is Not an Exit.” All of my stories have multiple revisions, but that one went through I think ten versions before I found the right way to tell it; I started writing it in 2009 and finally finished it in 2013. I also don’t write in first-person much; I struggle with the “I,” its weird intimacy even when a story is far removed from my actual life. The retrospective “I” was the key that finally turned the lock. That story taught me patience, and to listen to what it was trying to tell me, so I have a soft spot for it. I think you have a gift for dropping beyond what I anticipate will be the floor of the story, i.e., we’ve dug as deep as we can but stand back, Bryn’s going down another level. An example of this is the ending of “When Are You Coming Home?” I anticipated the characters would end on a coming-together moment, that “good moment” Robert is hoping for, but then there is another truth lurking below this. How do you know when you’ve reached that final level, when a story is truly done? What a great phrase, the floor of the story. Now I’m picturing myself with a shovel and pickaxe and—why not!—a pith helmet. Funny that you say you thought the end of that story would be a coming-together moment. I did, too. When I originally started writing that scene, I intended to have it be what Robert wants: “a good moment, a strand of hope, a tiny victory.” But this gets back to that idea of the falsely positive end. As much as I the author wanted to leave them on a good moment, it just didn’t feel earned. It wasn’t emotionally true. I worked on that ending as it is in the book for at least a week, maybe even longer, wrestling with what could happen. I wrote through the ending, which is advice I often give my students. Ultimately I found the right way out by relentlessly picturing the image of the pool water at night, which led me to the moon. I had to go back into the story and lay in seeds of that image—Robert noticing the moon as he sits in the truck, the memory of Lowell Observatory (a lucky part of the setting)—to make it work. Which I hope it does. I know it’s a tricky thing to end on a flashback, but that was what finally felt right for me, especially given what Robert has been unwilling to confront. You received your MFA from Vanderbilt and are now teaching at the University of North Carolina in Charlotte. How has being a writing student and a writing professor influenced your work? I had a rather circuitous route to a creative writing career, but my formal studies at Vanderbilt and also at Arizona State (where I did an M.A. in literature and took a couple of workshops) were no question influential. As a teacher and as a writer, I draw heavily on lessons from my mentors over the years. I can hear their voices in my ear, and I borrow their best questions and suggestions again and again and again. I learn from my students, too; the process of leading them to their own discoveries helps lead me to mine. The questions I’m asking them are the ones I’m always asking myself, so every class becomes a lesson/pep talk not just for them but for me. I think readers (and especially readers who are writers) are always curious to hear about a book’s timeline. Can you tell us how long it took you to write the stories, what happened when you submitted them as a collection, and what editorial role the staff at Prairie Schooner and/or UNP had in the process? I wrote the stories over about ten years, from about 2002 to 2012. Many in the book differ from their original journal versions, some more substantially than others. I’d say most of the changes are at the sentence level—tightening up creaky dialogue or loose sentences, tweaking an image, cutting adjectives—though I reworked “Fossil Light” structurally. I made most of those changes when I started putting the book together as a collection. Before I’d send it out—and when it got rejected, a lot—I’d go back in and read through the stories, fine-tuning here and there. I think mostly I was trying to remember what I loved about them, to stay close to the writing and keep the business side at bay. I started sending out a version of the collection in 2009 as “Meet Me Here,” with a few other stories in it; I hadn’t yet written the title story or the final story. “When Are You Coming Home?,” which I wrote in 2010, obviously gave me the book’s title but it also finally helped me see the book thematically; until then, I had seen the stories linked primarily by place and varied encounters. I knew the title story would be first, though I hesitated because the subject matter is so dark. I knew “This Is Not an Exit” would be last, and then it took me forever to finish. (I also didn’t publish it before I won the Prairie Schooner award; it got taken after). As for the rest, I reordered stories several times, trying to balance the funnier ones with the darker ones. I had to ditch a couple of published stories because they just didn’t fit. That left me with nine stories. I hemmed and hawed over that—so slim! Shouldn’t I have ten? or twelve? What’s the right number?— but I sent it, and there it is. Prairie Schooner was wonderfully supportive and mostly offered final approval. I think because the book had gone through so many levels of judging, their suggestions were minimal. I talked with Kwame Dawes about the order of the stories, and we decided to stick with what I had sent. Once it got to University of Nebraska, it went through some lovely, rigorous copy editing—I have a big soft spot for copy editors—which helped tighten it up even more. Then, it was in production and marketing and winging its way out of my hands. I know from your website you’re currently working on two novels. There’s often a push from the publishing powers for short story writers to work on novels instead. Do you feel that pressure, or is this just the next organic step in what you want to do as a writer? How has writing short stories prepared you (or not) for writing novels? Yeah, that push to the novel can be disheartening, but in this case, I think it’s more that the stories in my head were broader in scope, demanding the space of a novel. And I wanted to push myself, too, to see if I could do it. My MFA thesis was a novel; alas, that poor little thing probably isn’t going to make it out of the drawer. Though it’s hard to spend so much time on a project that doesn’t have the legs, writing it taught me so much about the process. One of the two I’m currently working on also is in the drawer—well, let’s say back burner. I’m trying to puzzle out a structural problem, so I’m letting it simmer. When I set it aside, I started working on stories. I wanted to go back to the short form; I missed it for the precision, the intense focus, the unity of effect. Hell, I also wanted to finish something. And then the damn thing took a turn on me and became a novel. Now, I will say that the chapters are story-like—they have arcs, they have different protagonists, and they can (almost) stand on their own—but once I started intertwining them, building and weaving a plot through all the stories, I was doing the work of the novel. Novel, novel-in-stories, story cycle—I don’t know, whatever. Right now, I’m just plowing forward and trying to get down what I see in my head. Lately “herding cats” is the analogy that keeps coming to mind for the novel vs. story processes. With a novel, you’ve got all of these mewing bodies wrapped around your ankles, crying for food. You’re clutching at tails—one’s under the bed, another’s up a tree, another’s on your head. A short story is just one cat—darting out the front door, pooping in the flowerbed, clawing the furniture. All of it is cats—ignoring you, judging you, making you feel like an idiot. The difference is just how many you have to wrangle at once. Once I nail down this novel draft and before I turn back to that other novel on the stove back there, I want to write a standalone story. As a reader, short stories make me hold my breath. They steal my breath. Novels and films can too, but with the long form, it’s more of a slow buildup, an accumulation of moments. In a good short story, I’m on edge from the first line all the way to the end. Erin Flanagan is the author of two short story collections published by the University of Nebraska Press: The Usual Mistakes (2005) and It’s Not Going to Kill You, and Other Stories (2013). Her fiction has appeared in Prairie Schooner, Colorado Review, The Missouri Review, The Connecticut Review, the Best New American Voices anthology series, and elsewhere. She’s held fellowships to Yaddo, The MacDowell Colony, the Sewanee and Bread Loaf Writers’ conferences, and this summer served as faculty at the Antioch Writers’ Workshop. 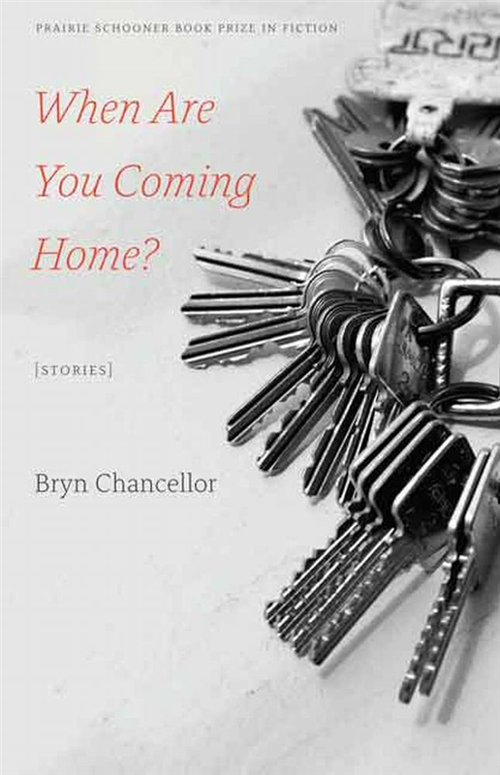 Bryn Chancellor, Erin Flanagan, Prairie Schooner, Prairie Schooner Book Prize, University of Nebraska Press, When Are You Coming Home?